When I was a child I used to hear the elders in my life toss about the phrase, “Truth be told.” I never quite understood what it meant until I became an adult. “Truth be told” is a testimonial phrase. It is what a person will say when they want a listener, or reader, to understand that the words about to come from their lips, or pen, possess a pinch of brutal honesty. I’ve decided to write a series in this forum and I’m calling it “Truth be Told.” I may decide to only write a few, or it may end up becoming another aspect of my borderline obsessive-compulsive nature. I’ve been bogged down in a world of deadlines, paperwork and linear thought processes. For me, an artist, this might be considered a “near death” experience. But to survive in a world of “cash is king” one must pay the cook in order to eat the meal. I’m not a naive. I fully comprehend the importance of splitting my brain in two, at time, in order to assume the respective roles of “entrepreneur” on left and “free spirited” artist on the right. I sat down earlier today and decided to do something that required as little thought as possible. I needed to clear my mind of excel spreadsheets, marketing plans, grant writing and php coding (yes, yes… I know coding is an “Art” but it does not feel like it when you temporarily lose the ability to converse with other human beings in a commonly understood language). What I decided to do was to take a walking stick that I have from Ghana and embellish it. I had beads and other things I wanted to add to it in order for it to reflect more of my personality as an artist, as a storyteller. When I began working on my walking stick, I felt an acute sense of heavy weight falling from me. Inexplicable? Yes, but I don’t know any other way to describe it. It felt, literally, as though a pressure valve had been lifted and, whatever it was that needed releasing, was being released. I continued refashioning the cane into something that would be even more visually impressive. I soon lost myself in a space of creative energy. It felt like a thirst being quenched, nourishing. Whenever I would begin to try to analyze the feeling, it would take flight from me like one of those beautiful hummingbirds that appear outside of your window. When I would relax back into my cocoon of creativity, the energy made its presence felt almost immediately. 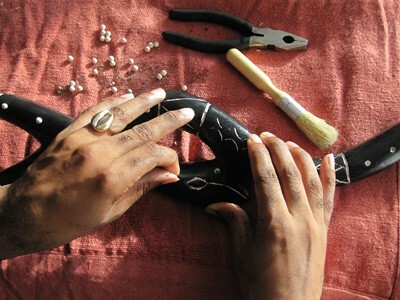 As I continued working on the cane, I began to envision stories that I could tell. The cane is shaped like a serpent. I’ve got tons of stories relating to the infamous, and historically sinister characteristics of snakes. There was flood of ideas inundating my consciousness. Stories, proverbs, fables and images swirled around in my mind like a storm. The more I denied myself analysis of what was happening, the more the flood of creativity broke through the damn of my linear thought processes. When I got to the end of adding beads and shells to the serpent shaped cane, I felt a bit of sadness. I wanted the flow of creative energy to continue unabated. I rushed into my office and scribbled down notes from the ideas that had free-flowed through my mind. As I write these words, there is a catharsis that has washed over me. I am feeling balanced at this moment and I can only attribute it to the actions of engaging in something creative. I am always asked questions about developing creativity. I’ve sat on panels at conferences and discussed the concept of teaching creativity. I have never been able to give clear, concise answers to any audience questioning me on developing creativity. The processes of evolving creatively are so unique to each and every individual. I can only speak authoritatively from my own vantage point. As with most of the conferences I’ve attended, or panels I’ve sat on, there tends to be a strong sense of urgency associated with finding that “magic button” to push that will unleash the creative aspects in our personalities. I think sometimes, in our pursuit of answers, we forget to ask the right questions. We place the proverbial cart before the horse. Is our desire to construct an aesthetically pleasing, more attractive culture of consumerism, or is it to unlock the human potential lying beneath the surface of each and every individual?